While the Panzer I and II are not as famous as the German tanks produced later in the Second World War, they played a vital role in Hitler's early blitzkrieg campaigns and in the Nazi rearmament program pursued, at first in secret, by the Nazi regime during the 1930s. Anthony Tucker-Jones's photographic history of their design, development and wartime service is an ideal introduction to them. Both Panzers saw combat during the invasions of Poland and France, the Low Countries and Scandinavia during 1939-40. Although by the time the Wehrmacht invaded the Soviet Union in 1941, the Panzer I had been virtually phased out of service, in the form of self-propelled guns they continued to see combat well into 1943. The Panzer II was also phased out with the panzer regiments in late 1943, yet it remained in action on secondary fronts and, as the self-propelled Marder II antitank gun and Wespe artillery variant, it saw active service with the panzer and panzer grenadier divisions until the end of the war. 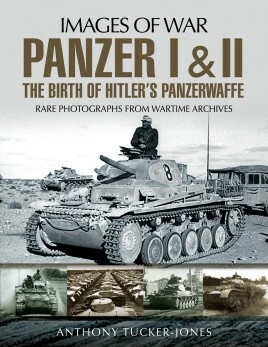 The Panzer I and II were the precursors of the formidable range of medium and heavy tanks that followed – the Panzer III and IV and the Panther and Tiger – and this book is a fascinating record of them.